For a royal stay, Residence de Eese offers several types of group accommodation. You can choose between the 18-person type called Eeserburcht (NL-8346-37) and the 28-person type called Kasteel de Eese (NL-8346-38). 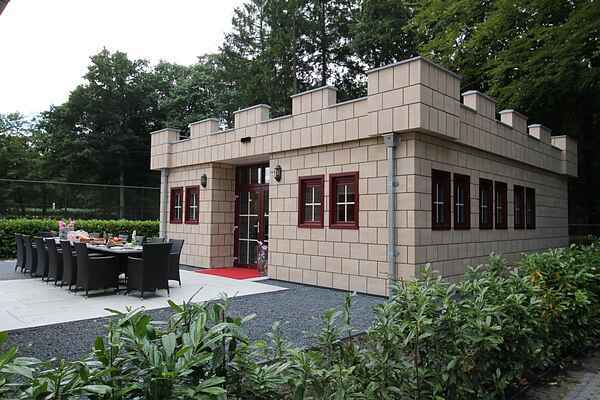 The Eeserburcht type consists of two parts in an elevated position on the edge of the park, offering a direct view of the holiday park's freely accessible tennis courts. The 'living fortress' is a large, superbly comfortable space with a unique royal theme. This atmosphere is reinforced by the unique handmade round sofas and the well equipped kitchen that features, among other things, an American refrigerator and an ice cream maker. The beautiful, long French wine table is eminently suited for long dinners where everyone can get together. This building also features two bedrooms, a bathroom and a separate toilet. The 'sleeping fortress' is a separate building with three bedrooms + three bedsteads and two bathrooms. This space is ideal for everyone who values a good night's sleep while part of the group is still awake in the other building. Kasteel de Eese type is equally comfortable and even consists of three parts: a 'great hall' and two 'sleeping fortresses'. Naturally, the great hall features a spacious, attractively furnished living room with a fully fitted kitchen and a cooking island. Again, the long dining table is a real eye-catcher! In contrast to the Eeserburcht, all bedrooms are in the other two buildings. Each sleeping fortress houses three bedrooms + three bedsteads and two bathrooms. These sleeping accommodations also include a King's Room, a Queen's Room and a Princess Room. Both types feature a beautiful terrace with enough garden furniture to seat everyone!